In Italian lava piedi means "wash feet". The washing of the feet of visitors goes back to ancient tradition. In the time of Jesus Christ much of the populace walked from place to place. People wore sandals, the roads were dusty or muddy, feet were aching for refreshment and renewal. The custom of washing the feet of visitors was most welcomed by weary travelers along the path. Palma Christi is one of the common names for Ricinus communis. The fruit of Palma Christi forms a capsule containing three seeds which yield oil. Annabella grows Palma Christi in a flowerpot next to her front door. This plant with her fruit, seed and oil represents the ritual of foot anointment which is practiced by Annabella after the feet are cleansed. Annabella gathers flowers, leaves, stems and sometimes bark, she mixes them with sea salts. With song and prayer she engages the help of the sun in the day and the moon at night. These are the energies most understood by Luna Fina. Visitors place their feet into a porcelain tub. They begin to absorb the vitality of the waters, the salts, the herbs and the flowers. Later a floral or floral and root oil mixture is used to anoint and massage each foot. 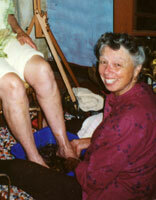 You can watch a video of a Sacred Footbath: http://www.youtube.com/watch?v=5cWywgY5dqM.